Breathing giant clouds of sulfur gas at 4 am is not pleasant. Doing so after a long hike up the side of a volcano is even worse. We quietly snuck past our armed guard and out into the night. The plan? 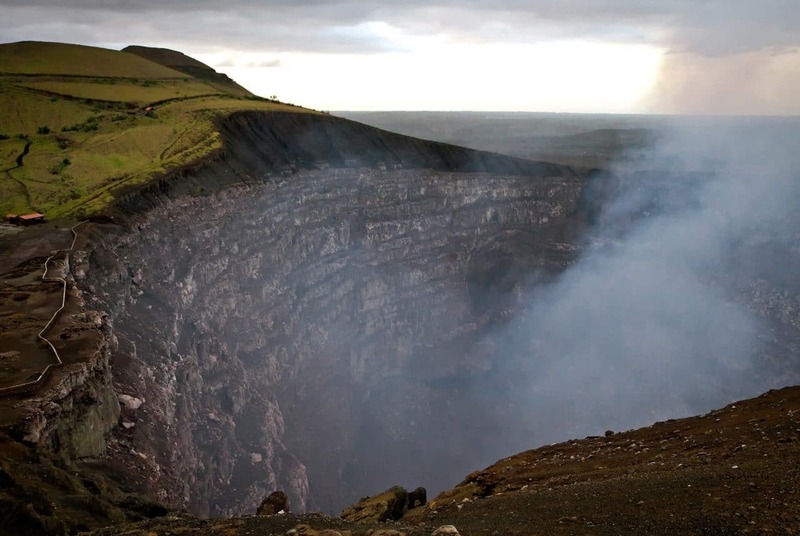 To Climb Nicaragua’s Volcano Masaya, and take a look at the lava bubbling down below. But sometimes interesting photographs call for extreme measures. I wasn’t about to miss my chance for a photo of glowing lava with a particularly long & terrible history. It all started with a TweetUp (meeting of Twitter users) for dinner and drinks. SuperXicana, BreakawayBackpacker, VagabondQuest and I started to plot what we should do together the following day. Obviously it needed to be unique, as we’re all travel bloggers who crave interesting experiences. Climbing the nearby Volcano Masaya was suggested, as none of us had done it yet. But that wasn’t unique enough… we needed something more. 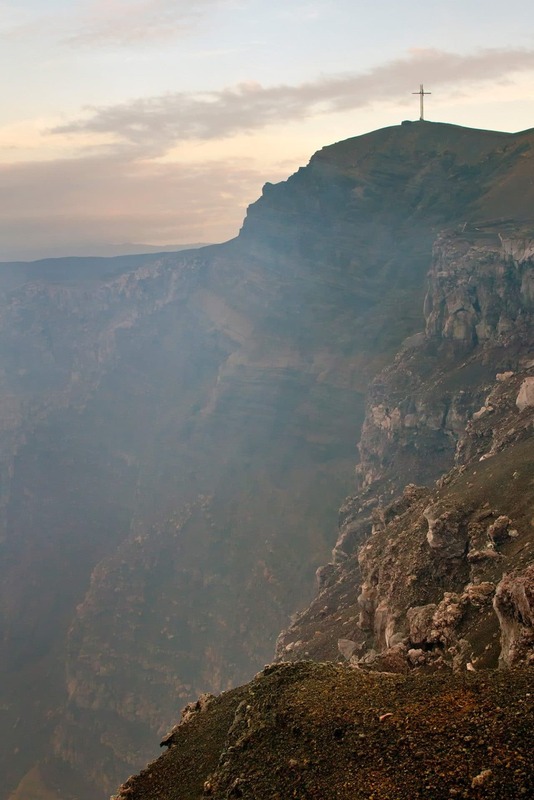 How about sneaking into the national park & spending a night on the volcano itself? After getting ready we jump on an incredibly packed mini-bus bound for the town of Masaya. The plan is to hop off at the entrance to the park, pay the entry fee, hike 3 miles up the road that leads directly to the crater, then run off and hide until the rangers close everything down for the night. 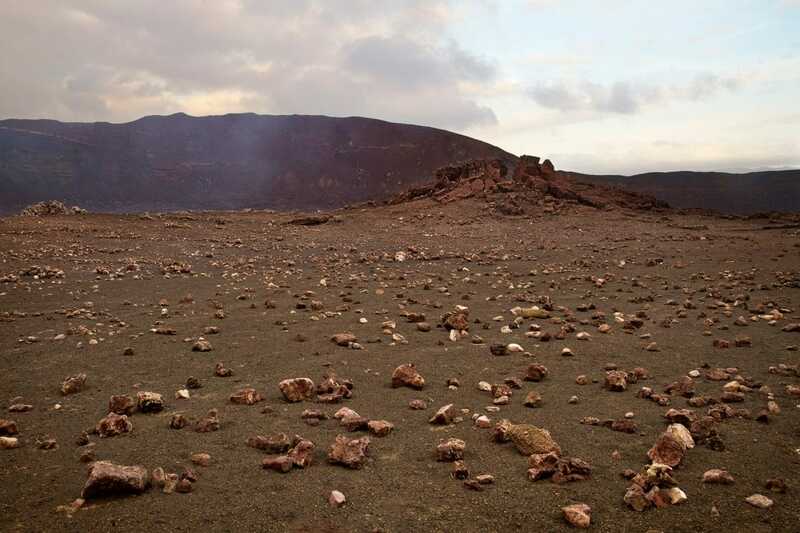 We would then re-emerge to spend the evening stargazing on the top of an active volcano! Unfortunately, our plan wasn’t foolproof. When we finally arrived at the park entrance, they were about to close down. The rangers wouldn’t let us in because they’d have to kick us out before we even made it to the top. Luckily there was another option. Spend $10 on a guided night tour. As you may know by now, I’m not a fan of big tours. Guides rush everything because they just want to get paid & go home. I never have enough time to set up and take good photos. You often have to put up with obnoxious, complaining, or rude people in the group. Most of all, rarely is a guided tour actually needed. I’m pretty confident in my abilities to follow a trail, and if I want to learn the backstory of a place, I can look it up online or read a book. This tour turned out to be ok though. 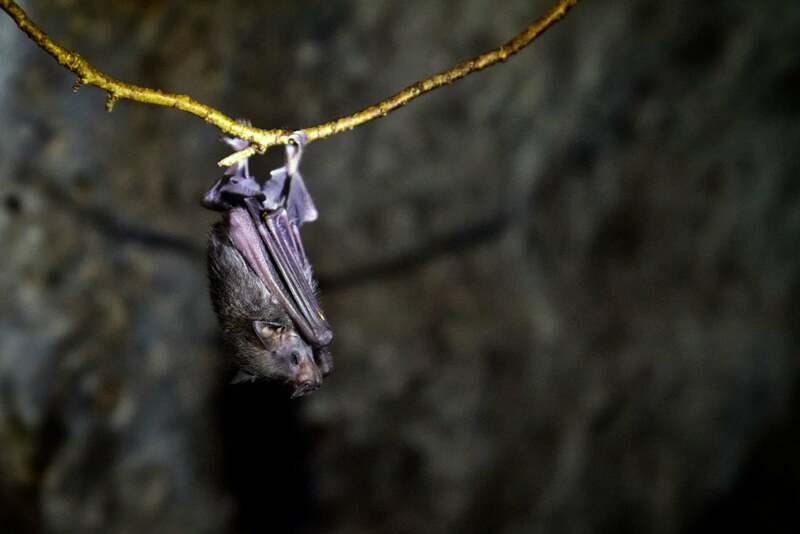 We got to climb into ancient lava-tubes that were filled with bats, and learned about the human sacrifices that happened in them 500 years ago. In typical cave-tour fashion, we turned off all our lights to revel in the complete darkness. Did I mention the other reason I don’t like tours is that they’re all so predictable? Unfortunately it was becoming clear that we wouldn’t be able to just slip away from the group without them noticing. Our guide knew us by name. Getting discouraged, we tried to bribe him into letting us stay up there. He said he could care less if we did, but he was responsible for making sure we left the park. There were papers that needed to be stamped saying we made it out. He didn’t want to lose his job. Completely understandable. So we decided to go over his head. At the ranger station, we pleaded with the supervisor to let us spend the night. With much coaxing & convincing, he reluctantly said yes. But he wanted us to pay. After a bit more negotiating, SuperXicana miraculously managed to talk him into letting us stay for free. Success! Except we had to sleep at a campsite at the base of the volcano, not on the top. Oh, and the campsite was guarded by a man with a shotgun. While we took turns passing a bottle of rum around the fire, another plan was formed. We’d sleep for a couple hours, then wake up at 3am to hike the volcano in the dark. It’s not hard to wake up at 3am when you’re sleeping on the rocky ground without pads or tents. Predictably, none of us got much sleep. At the appointed time, and while maintaining a flashlight blackout, everyone stumbled around in the dark getting ready as quietly as they could. We then stealthily snuck past our armed guard and out into the night. Freedom at last! Once on the road, it took about an hour to make it to the top. I was finally able to set up my camera and get a photo of the glowing lava at the bottom of the Masaya Volcano. We also had free reign to explore the area on our own. Hey Matt! So glad I found your post! Your original plan was exactly the plan I had, I’ve done it at a lot of national parks, but this is my first time in Nicaragua, so I’m glad to have a heads up! Although, in your situation, I probably would have waited until they left and just snuck in to stick to my budget goals! As The Travel Economist, I’m all about finding great and unique adventures on a tight budget! Thanks for stopping by my page earlier. How long are you in Nicaragua? If you read my latest post, perhaps we may cross paths soon! Great pics-I have climbed only one volcano and I definitely did not have the kahunas to do it at night. This is what can be defined a memorable adventure, the first photo looks absolutely amazing, I would have been so frightened though.. I bet you could have done it Angela! Wow, what and adventure. I want to go to Nicaragua so bad. 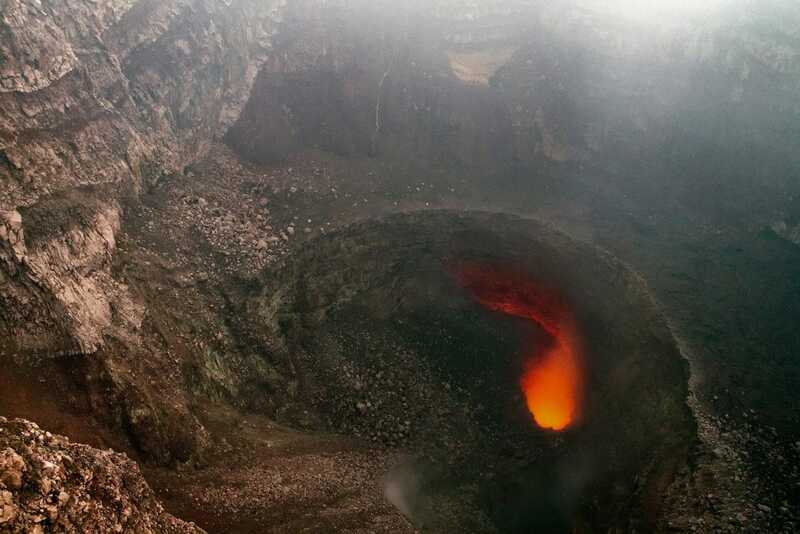 By the way, the photo of the crater is amazing. I haven’t really seen a crater. When I went to Costa Rica, the clouds were so low that I wa snot able to see the craters of the volcanos I visited. Thx Ruth! I keep going back to volcanoes again & again because they’re so cool. The diversity between them is fascinating too. Nicaragua certainly has a bunch of em’. Ah, I love this Masaya journey, it even makes it to our top 10 memories :) Thanks for the great night!! Not a fan of guided tour as well, for same reason with yours. The guide we had must think we were the slowest tourists ever! Maybe this will sound funny, but I was kinda glad we took the tour in Spanish, so I could tuned him out and doing my own thing. Didn’t have to listen all the warning like ones that I occasionally heard from the English speaking tour. So many amazing things happened that night! Matt just send cigars to Curmudgeon, will ya? He doesn’t realize smoking is not good for him. Awesome story. I love it how the group never gave up and kept problem solving to finally get the great photograph and the fun adventure. Great post… you captured it all. This was by far one of my best nights on my trip so far. I had a blast with all of you and love that we got to share this unique experience together. It was also very nice to finally meet you after so long of following your blog. First, it’s not nice to evade the rangers. The rangers are always nice. As the sign says, it’s not a safe place. Sorry, but I’ll have to tell your mother and Gribgee – on Easter. I’ll wait until after church, but if there is an Easter Basket for you, I’m eating it all. You’ll have to learn. I noticed the photo with the cross to guard against demons. I don’t understand, your sissy has never been there. Did you mention her name to anyone? I also noticed the smoking crater – I am not smoking. I could be. 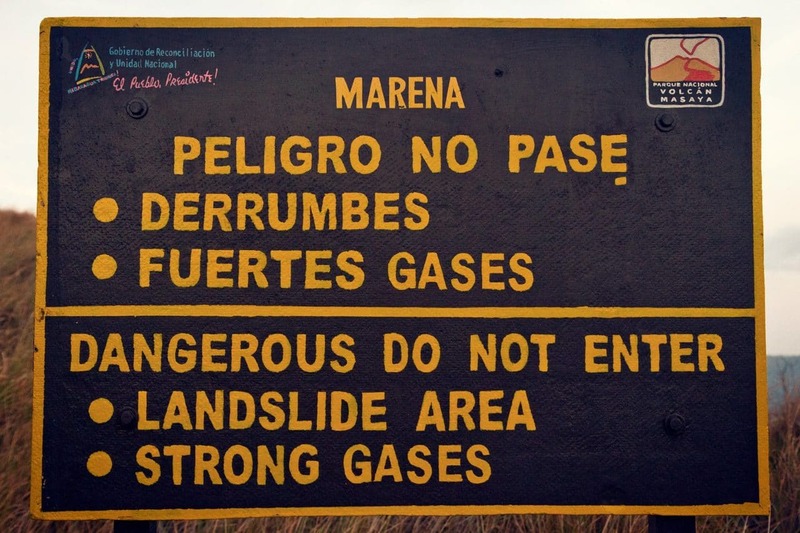 Those same rangers walked us right past this danger sign on the tour. It’s only for liability reasons, when that whole road eventual falls into the crater one day. I’d be willing to bet you a package of delicious Nicaraguan cigars that having a ranger with them when it happens won’t save anybody. I would never bet in a religious week. But I will mention that your Gribgee has mentioned how nice it would be to have cigars for Easter. And, Mothers Day is coming upon us in May. Whiskey and cigars would be just the thing. Just put them in my name. You never know whose watching. I’ll see they get where they are going. Trust me.